Images of China’s J-31 stealth fighter are in high demand given the nature of the technology and rumors about its future. 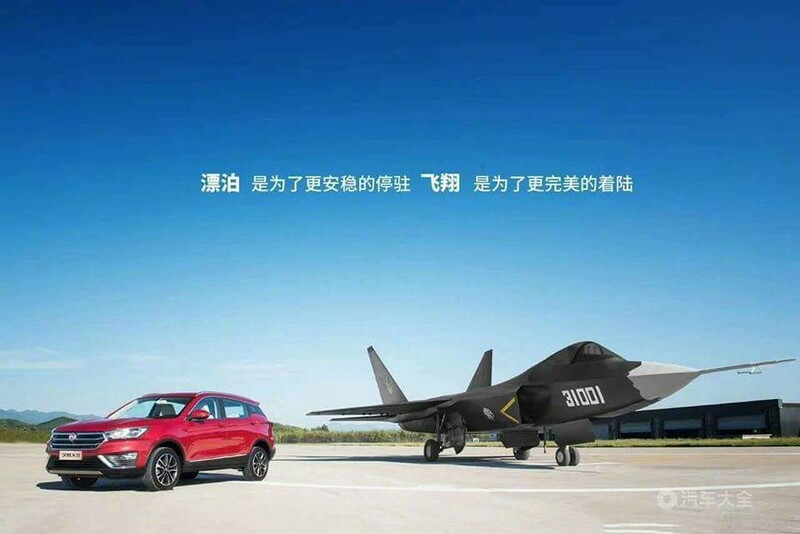 It was odd, then, that the prototype fifth-generation fighter jet recently appeared in photos posing next to an SUV. 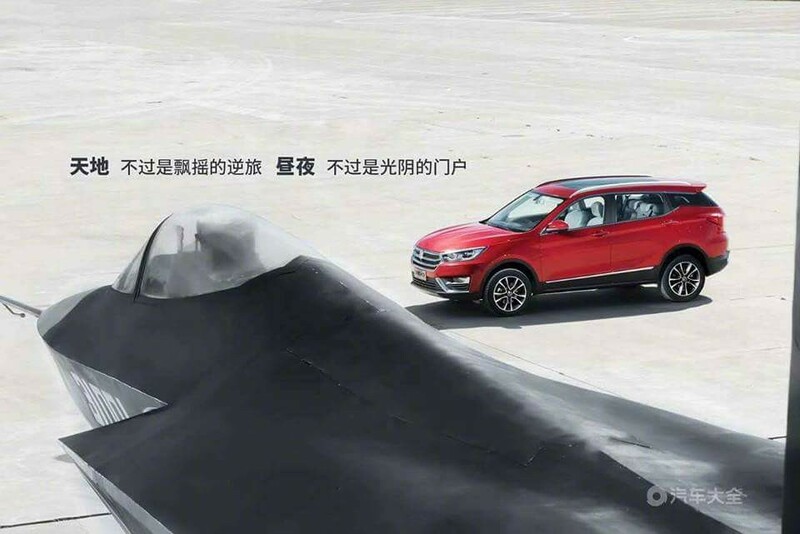 Turns out, the bizarre photographs are not an advertisement for the J-31 but for an SUV called the X5 by Hanteng Autos, a relative newcomer to the Chinese auto industry that is now, apparently, trying to ride on the J-31’s wing flaps. 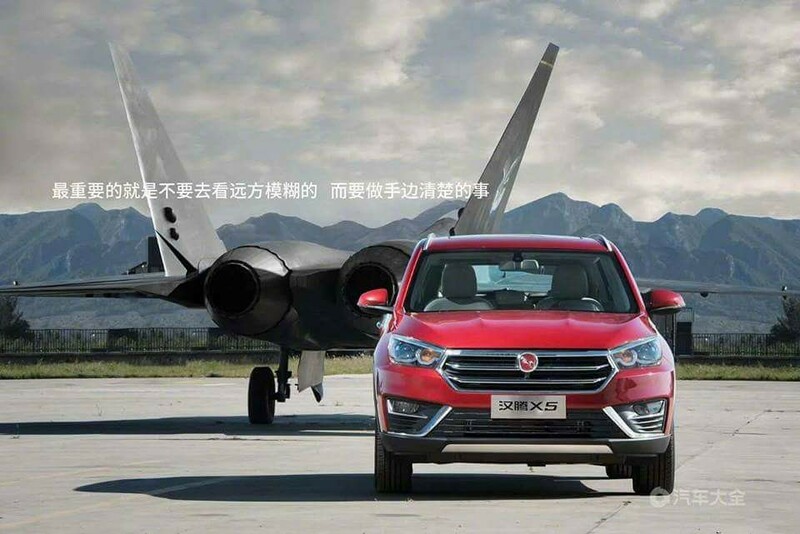 The ad stressed that the SUV — painted in highly-symbolic red — symbolizes “industrial strength” and “national strength,” just like the fighter jet. So, this is a marketing attempt by a new company to tie its SUV to nationalism and the military. What’s more curious is the presence of the fighter, which was developed by the state-owned Shenyang Aircraft Corporation. The J-31, officially the FC-31, is a unusual for Chinese fighter jets in that it’s a stealth plane which might not ever see service in the Chinese military, at least in its present form. Think of it as more of a demonstrator aircraft for a future fighter — a J-31 mockup has appeared aboard the carrier Liaoning — and as a marketable product for potential foreign buyers such as, perhaps, Iran or Pakistan. It’s now also way to help sell sport utility vehicles. But one of China’s biggest problems with the J-31 has been finding a buyer willing to walk off the lot with it. Generally speaking, the J-31 is a competitor to the F-35 Joint Strike Fighter. It’s about the same size and weight, although the J-31 is less stealthy and lacks the advanced avionics and communications hardware of the JSF — although a second, enlarged and heavier J-31 which first flew in December 2016 came with a new infrared sensor. These two prototypes are the only J-31s publicly known to exist. The J-31, to the designers’ credit, has two engines instead of the F-35’s single turbofan, and the Chinese fighter doesn’t have an internal lift fan like the F-35B, which forced design compromises inside the other two JSF versions, making them very hot and reducing aerodynamic performance. This is the source of speculation that China — perhaps informed by the F-35’s design files — set out to build the J-31 as an F-35 without repeating some of the F-35’s mistakes. The second J-31 prototype also featured smokeless engines, unlike the first prototype, enhancing stealthiness. An operational version might one day be heavily armed with 12 air-to-air missiles, befitting its role as an air-superiority fighter — although, again, it will need to find a buyer. Maybe the Chinese navy. Maybe another country that will not or cannot buy F-35s but wants to compete. In any case, let’s hope future customers make sure it comes with a warranty.